What are fitted diapers like? Fitted diapers are not waterproof, so they generally require a separate cover. They also tend to be quickly outgrown, with babies going through 3-4 sizes in their diapered years. Fitted diapers are made of multiple layers of absorbent materials with some layers hidden within the diaper. They are not easily put on and taken off over the feet, so are generally changed lying down. The diapers' absorbency can not be modified within the diaper, a doubler must be laid in to increase absorbancy. So how do Antsy Pants™ compare to fitted diapers? Antsy Pants™ are very leak-resistant compared to fitted diapers and allow for faster diaper changes for toddlers on the go. They do not contain any hidden layers of fabric that might not come clean in the wash as fitted diapers do. Antsy Pants™ are designed so that every layer of fabric is open to unobstructed contact with the wash water to get the absolute best cleaning possible. Antsy Pants™ do not need any additional covers to control leaks. 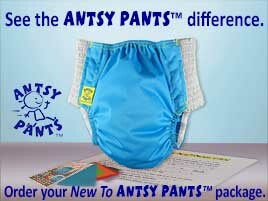 Antsy Pants™ are designed specifically for quick standing diaper changes for squirmy toddlers on the go.